The Taunton range is a great option for the mid-sized conservatory. Comfortable sitting posture and traditional style are its prominent features. 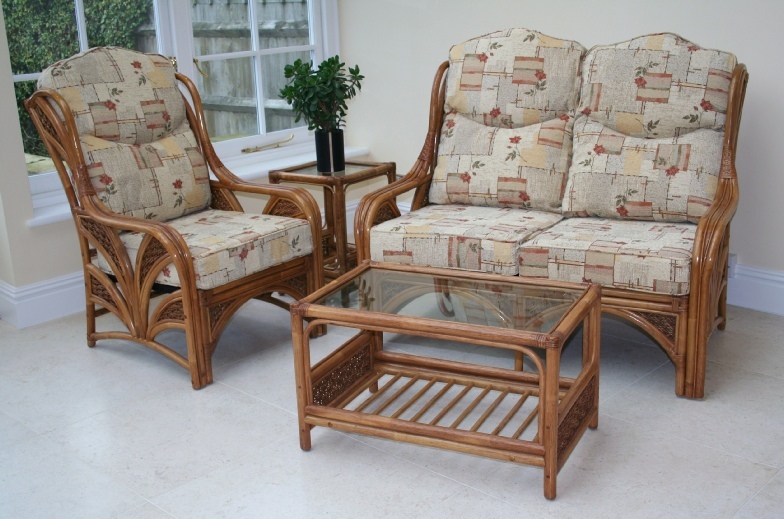 The palm leaf design on the panels are woven with a combination of rattan core and banana leaf rope. Available in either Natural or Walnut finish, with a choice of fabrics. Click HERE to view all available fabrics for this range. We operate a 2 tier fabric system. Standard Grade is the cheapest fabric and is usually 100% cotton. Premier Grade consists of more expensive fabrics and are more hardwearing. All of the fabrics are removable and can be dry cleaned. Replacement cushions and covers can be ordered at a later date, should you wish to refresh your furniture. We offer a 2 year structural guarantee on all of our frames. For more information click HERE. World Of Wicker also offers a 30 day money back guarantee on all purchases made online or over the telephone. For more information click HERE. All of your furniture will arrive fully assembled. For more information about our delivery options click HERE.